We have a fabulous lineup of international artists for your weekend in Machynlleth (31 July to 2 Aug) – as you can see on this page, which has been updated with all the confirmed acts. We’ve also got film, theatre and workshops, and a full politics programme, so it is going to be quite a weekend! 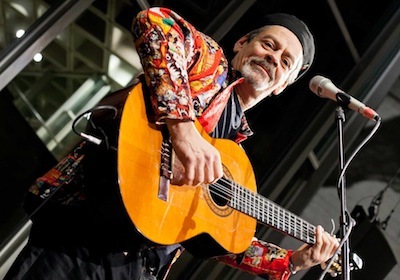 Alejandro was a friend and musical colleague of Victor Jara. 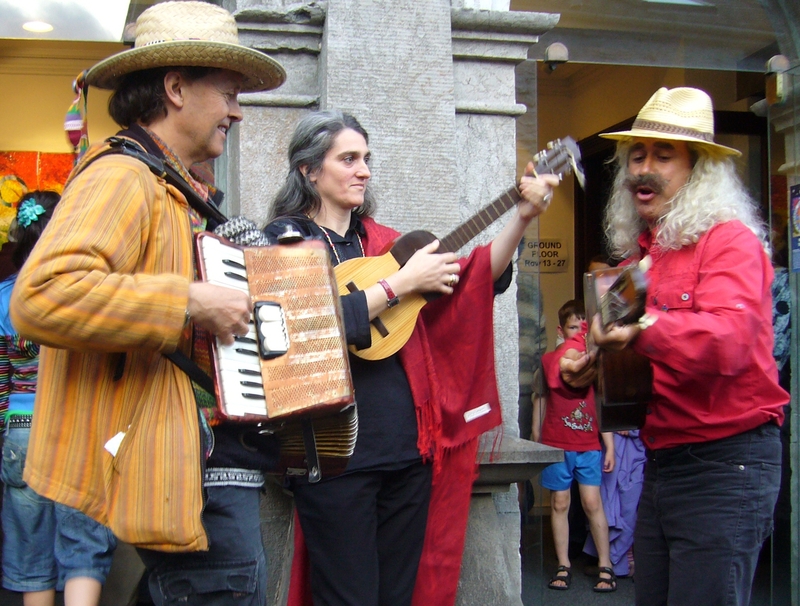 As a founder member of folk band Cuncumen, he auditioned Victor for the group. We are honoured that Alejandro is returning to the festival. He will play a few songs with local harpist Cerys Havana. 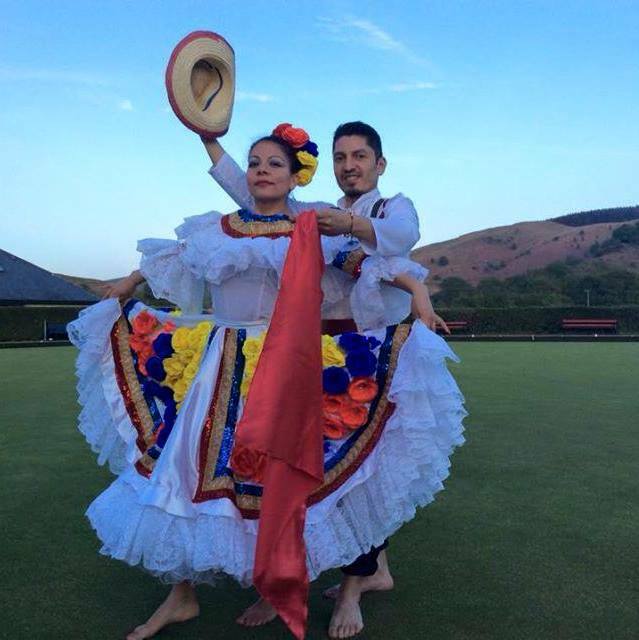 Colombian music and dance from Catufa – pictured here on the bowling green in Machynlleth at our fundraiser in May. They are cultural warriors who perform the traditional dances of Tolima and the Andes. 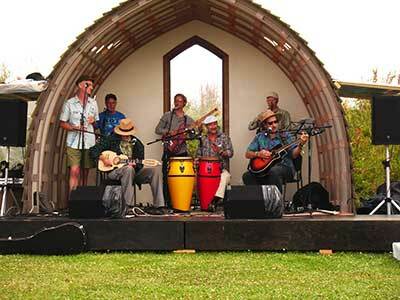 Machynlleth’s very own Latino band aim to get everyone up and dancing on Sunday morning. 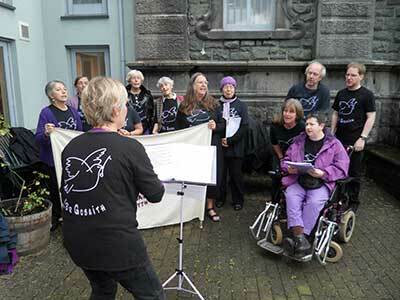 Aberystwyth community choir Côr Gobaith sing their songs of protest and hope. Steve Tromans and The Days of May jazz band perform Music in the Time of Revolution, composed and arranged by Steve. Based around the work of poetic-political artists including Victor Jara, Allen Ginsberg and Albert Camus. Plus Q&A. Expresion Inka perform traditional dances of the Inca people. They are also bringing their play, ‘Yaku‘ (‘Agua’ or ‘Water) about the damage being done to Mother Earth. Flakito is an accordionist from New Zealand presenting songs collected from his travels in Colombia. Locally based Gwilym Morus has a distinctive bass voice and combines the traditions of Welsh folk with African influences and his own songwriting. Kausary – Ayllu Project, from northern Peru, have a rich repertoire of traditional Andean and contemporary Latin sounds. Andean music comes from mixing native instruments like the zampoñas or sikus (panpipes) or quena (Andean flute) with guitar and the famous charango (a small guitar originally made from an armadillo shell), combined with romantic lyrics. Wind instruments and drums form part of the melodies from magnificent cultures like Quechuas and Aymaras. Led by Johnny Rodriguez, Kausary combine panpipes, salsa, rumba, cha cha cha and jazz. Sweet, melodic and emotive. 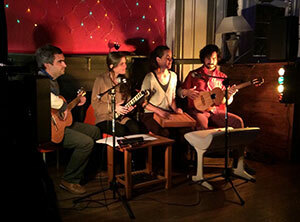 La China Veleidosa are a Chilean band based in London, dedicated to the traditional folk music of central Chile. They specialise in Cuecas, Tonadas and New Chilean Song. They look to the figure of the Cantora (female singer), embodied in the legacy of Violeta Parra and her research on rural culture. This inter-generational group of singers from the Latin community in London have come together to share their enjoyment, experience and knowledge of their continent’s repertoire. 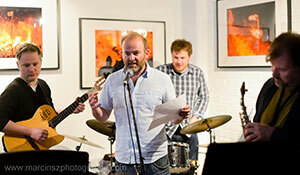 They will sing at our Friday night acoustic showcase concert in the Plas Hall. 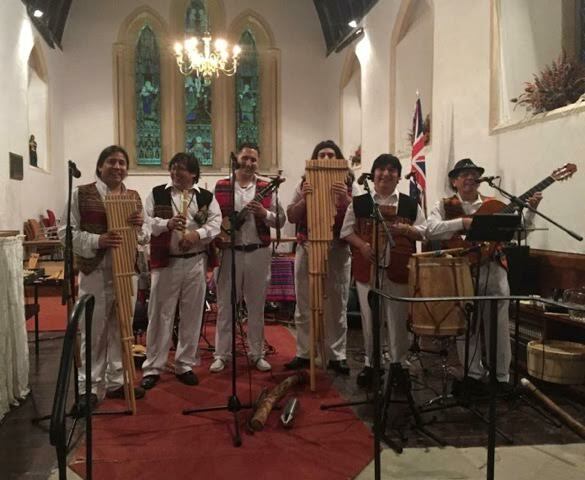 Rompiendo Fronteras (‘Breaking Boundaries’) will be presenting original and haunting arrangements of folk ballads and anthems of Latin America. The principal arranger and composer of the band is Bolivian, Milton Flores. 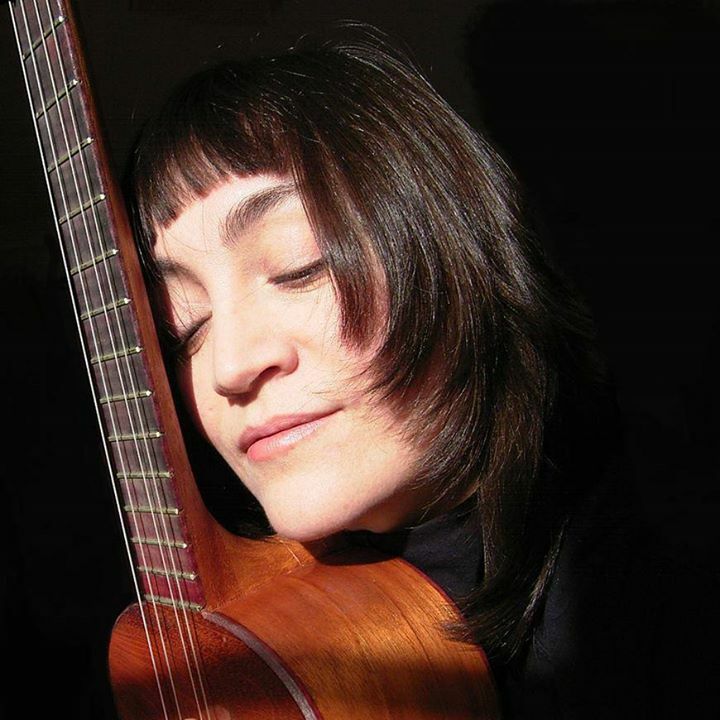 Their repertoire creates a shimmering collage of melody and harmony, capturing the essence of the songs of Victor Jara and other great Latin American composers. Quijada (the name comes from a South American percussion instrument made from a donkey’s jawbone) is an Afro-Cuban / Salsa band based in Penzance, Cornwall; with Peter Fox on percussion, Graham Gynn on tres and quatro guitar, Adam Wheeler on guitar and vocal, Nick Hall on electric bass, Matt Spittle on clave, guiro and vocal, and occasional guest musicians. Formed in 2009 by Peter and Graham, Quijada has been influenced particularly by the music of Buena Vista Social Club, although they also do a lot of their own songs. Many of the musicians also have other musical interests (Peter, Rumba and Samba; Graham, Jazz; Nick, Flamenco), which have taken them to Latin America, Cuba, West Africa and Southern Spain. 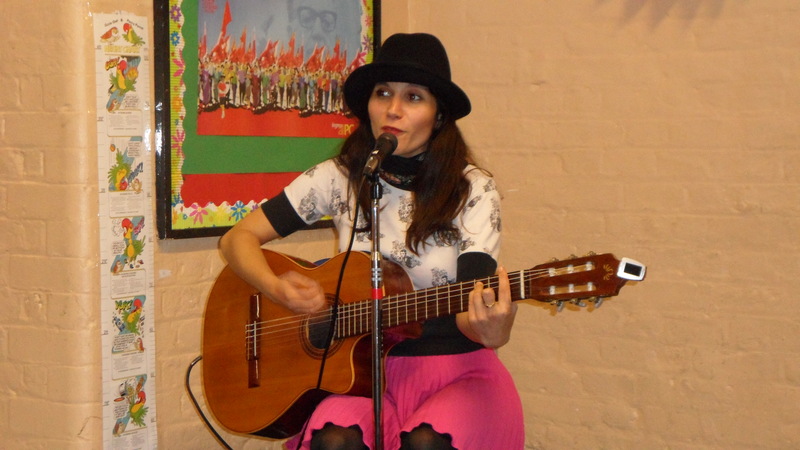 Silvia Balducci from Italy plays songs from the Chilean New Song movement. 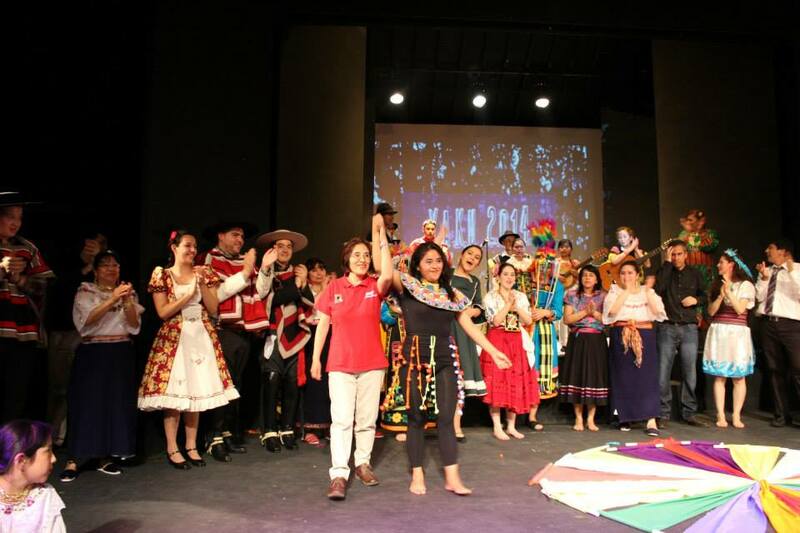 Latin America Community Choir and more! There will be lots of opportunities for playing music informally, so please bring your instruments and your voice. Razz is running an open mic on Saturday afternoon in the community gardens, Gerddi Bro Ddyfi Gardens, on the edge of the Plas grounds. We have a full programme of workshops and family activities for you too.